Elecraft KX3. Experiences from the field. 19/10/2013. Mt. Despair VK3/VN-013 4 Points. Following a Working Bee at the TLCCV property at Yarck, I had the opportunity for an unscheduled activation somewhere on the way home. I had looked at Mount Concord just out of Molesworth but, having done little research and unsure of access due to private property, opted for Mt Despair. The access roads off the Melba Hwy (Marginal Rd & Horse yard Ck. Rd.) are quite good and the VW Caddy with all the work gear had no trouble making it to Mt. Despair Rd where i was forced to stop at the seasonal road closure gate (Queens Birthday to Melbourne Cup weekends). From here it was a 4 kilometre walk (3/4 hour) to the fire tower along a good 2WD road. (Note for others – there were a few trees down that would have required removal for 2WD traffic). I set up not far from the fire tower right on the summit, using a gum tree for some shade and unfortunately disturbing some ants! This was my first activation that spanned the UTC roll over. It was also the JOTA weekend. I had not put out an alert and had no phone coverage. I first called on 30 metres SSB without success then moved to a very busy 40 metre band where Allen VK3HRA operating a JOTA station was my first contact followed by Peter VK3PF who spotted me. A quick activation with 4 pre-UTC and 5 post-UTC contacts. I tried hard to work Ed VK2JI who I could hear but we were unable to complete. The return trip down hill to the car was quicker than the ascent in the now quite hot sun shine. Returned towards home along Kathala Rd and Sylvia Creek Rd through to Toolangi. Be aware that this area is popular with motor bikes and 4WDS and the roads can be very wet and slippery over winter. 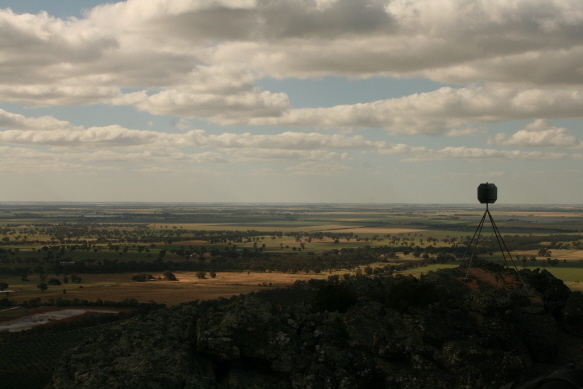 I had never been to the Grampians before and for Nan it was over 30 years ago. Seeing that we had been rained out on countless occasions over the Melbourne Cup Weekend, It was thought we would visit somewhere traditionally dryer; initially looking at somewhere in outback NSW but could nopt be bothered with a long drive, we settled on the Grampians National Park and headed off early on the Thursday morning to make an extended long weekend, get a good camp site and visit some of the more popular sites before the expected crowds. Camped in the South end of the park at Jimmy Creek Camp Ground (Allocated camp sites and fire places, pit toilets, cold water shower – no mobile phone coverage). We had resident Kangaroos and lots of bird life. Having set up camp, we journeyed to halls Gap to pay our camp fees and find out about any closures of roads, tracks, walking tracks and camping areas within the park (due to both recent bush fires and floods). From here we visited the local features such as the Balconies, MacKenzie Falls and Boroka Lookout (No activation). Before returning to camp. A leisurely start the following morning: Nan and I went exploring through the Victoria and Glenelg River valleys to the Victoria Range Track (closed over winter). Not difficult in a 4WD, this road has some bery steep sections and some ground clearance to navigate the spoon drains is required, a little boggy at the top and loose sand at the northern end. Along the way is Mt. Thackery, a yet to be activated summit – a temptation no SOTA Activator could ignore! Note, lots of bush fire damage present at the time. Heading north along the Victoria Range Track, in the immediate vicinity of Mt. Thackery is a clearing of sorts on the left (west). This is a short side track that joins back onto the main road but even 4WD access will be stopped by a deep gooey smelly black bog hole. Anyway, not far back from the bog hole is the walking path to Mt. Thackery, marked by a yellow cross on a burnt tree and with just enough stone cairns and bits of tree laid out along the way to make navigation easy. The track generally heads north west from the main road and the walk took a bit over an hour. Mt Thackery remains un-sighted for the start of the walk and then to gain access one needs to skirt the Eastern side northwards before reaching a gap where the terrain steps allow a relatively easy climb to a defunct trip point. Very windy. Once at the summit, and using the turned over trig as a squid pole support (nothing else available) the KX3 was fired up. Band conditions were terrible! I had only put out a general alert that we would be in the area, not knowing exactly what we were going to get up to so no specific spotting. Nothing initially on 40 metres or 20 metres. Checked all the antenna connections, RF definitely going out. Moved to 30 and worked Matt VK2DAG who kindly spotted me for 40 metres. I then worked Ian VK5CZ, Matt VK2DAG, Alan VK5AR/P, Mark VK7FMPR on SSB and Warren VK3BYD/P S2S Mt. Hotham VK3/VE-006 on CW. No luck with Marshall VK3MRG on Pyramid Hill VK3/VN-005 (CW rules!). The last contact was on 20 metres again with Matt VK2DAg who continued to help with spotting. Another fine day. Today Nan & I had a long awaited to the Mt. Zero Olive plantation. We are a great fan of their products which are available from a local Farmers Market. We stopped to also have an enjoyable lunch!. What a shame there is a SOTA summit nearby! Whilst in the area we visited the Gulgurn and Ngmadjidji shelters and Hollow Mountain (Wdjub-guyun) before ascending Mt. Zero. In the late afternoon, the wind was very strong and tending to cold. Band conditions were average but a vast improvement on yesterday. 17 contacts on 40 metres to Vk1, 3 and 5 including a S2S with Ben VK3FTRV on nearby VK3/VS-013. Activation time 23 minutes. 04/11/2013. Chimney Pots VK3/VS-005 6 points. Another area on Nan’s list so we headed off through areas significantly burnt with the fires earlier in the year. We followed some good dirt roads to a sign posted carpark. The sign at the carpark says 2.5 kms. Note that this is only to the look out, a great view but far removed from the activation zone. 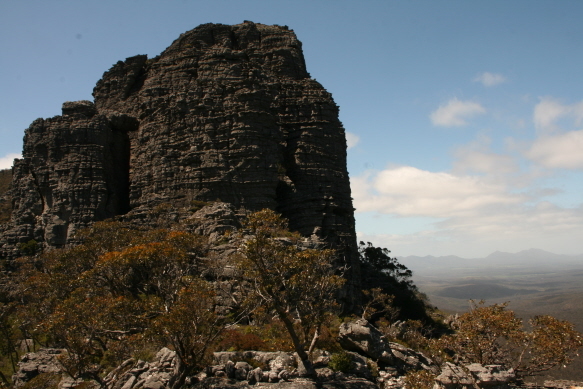 This walking track circumnavigates a rock outcrop peaking at just under 800 metres. To reach the activation zone, you will need to head north east just above where the loop junction, The distance is close to that already travelled if coming via the look out. The going is tough bush bashing through burnt scrub and will get worse once the re-growth takes hold. A very dirty trek. The antenna set up was a real compromise against the rocks. 12 contacts all on 40 meters ssb to VK3 and 5. 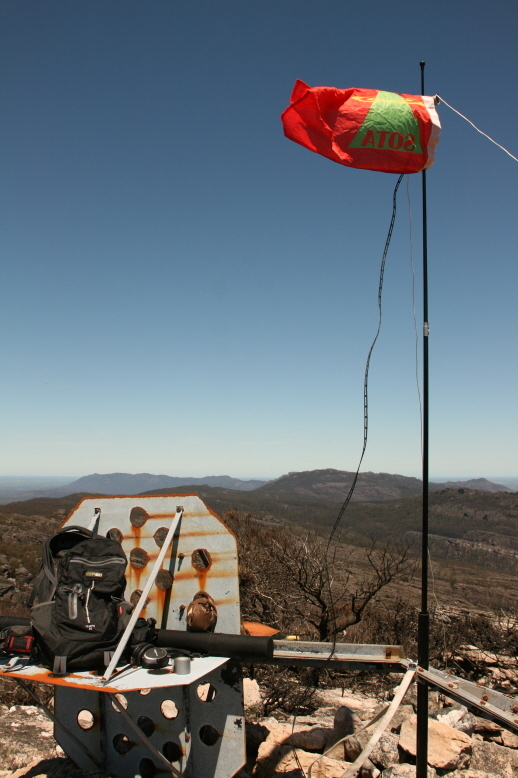 Nice to work Allen VK3HRA who had first activated this one – Allen has good information on the summit access.